Looking for a VPN that can do battle with some of the biggest names in the industry? Look no further than CyberGhost. This VPN powerhouse boasts numerous servers, fast speeds, and a no-log policy that will maintain your privacy. And just recently announced, CyberGhost can now unblock Netflix US! Read our review to learn more. Connect to 7 devices at the same time. If you are looking for a top-ranked VPN service, we recommend you check out Cyberghost VPN. CyberGhost is a worldwide company based in Romania that offers both CyberGhost premium and a CyberGhost free download – an increasingly rare tiered service in the hotly competitive VPN market. Can CyberGhost come out ahead in a battle with some of the industry’s dominant names such as ExpressVPN? In this CyberGhost review, we set out to find out. Good choice of servers in Europe. Nice UI with built-in support. Cybergohst do support crypto currency payment. Cybergohst are not subjected to the UK jurisdiction. How does CyberGhost fare when things go wrong or you simply need a helping hand getting up and running? The website provides a comprehensive guides section, which features all the support platforms in adequate detail. Those that want to speak to a human, however, can contact the company through email and live chat. The support has received some mixed reviews on popular consumer rating site Trustpilot. Our test query, however, was handled politely and quickly. 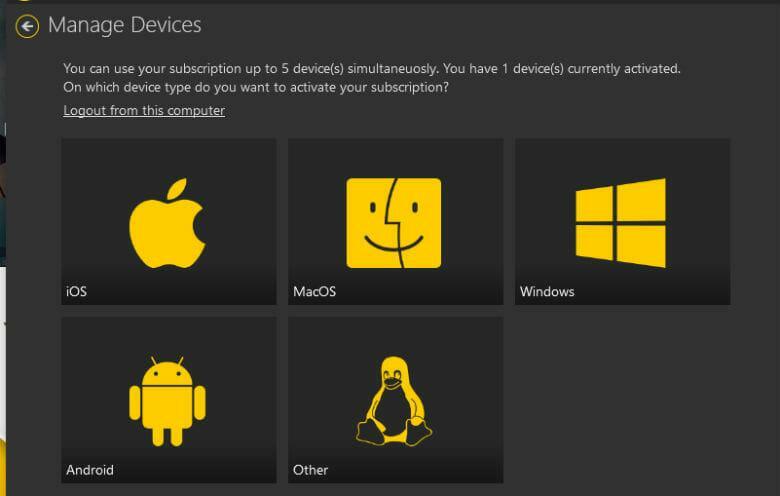 In addition, integrating the support window directly within the Windows app is a useful feature. CyberGhost currently operates 3,073 servers around the world. While this makes it a medium to large network with plenty of more niche options, its selection betrays its European origins (the company was originally based in Romania). Only 210, or 18%, of those servers, are located in the US; a far smaller proportion than some other providers. What’s a definite let-down, however, is the speed of some of the servers. We tested speed by selecting an IP in Dublin, Ireland. We saw our connection tank from 40.69 Mbps download speed to just 1.07 Mbps. This is just about the most cataclysmic drop that we have seen and at speeds that low, the connection was basically unusable for anything more bandwidth-heavy than viewing static HTML files. We had far better luck connecting through Milan, Italy (ping 31ms, download speed above 35Mbps) but some of the servers the company operates evidently suffer from performance issues. 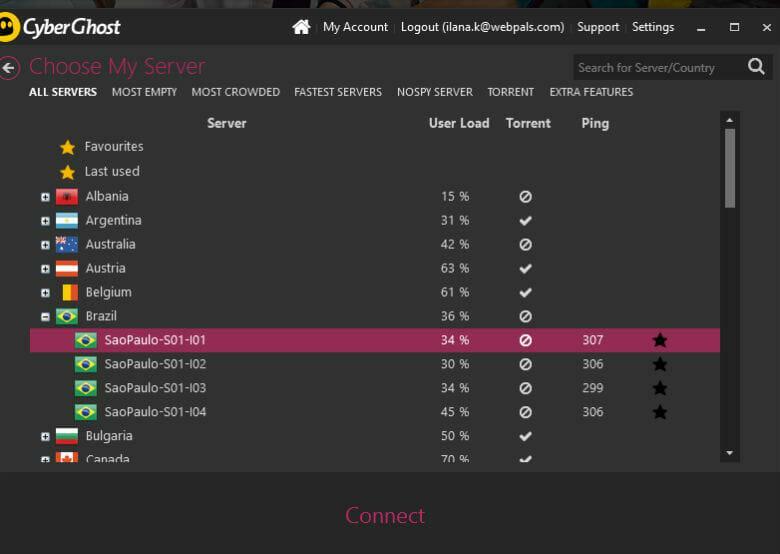 The ‘Choose My Server’ screen in the Windows application is also a well thought out tool that allows users to see comprehensive details about each server they’re considering connecting to including current user load, ping time, and whether torrenting is permitted on it (the application has a list of servers where torrenting is permitted, but the United States is conspicuously absent). Despite this, CyberGhost is still a no-logs provider. It has also posted a refreshingly plain language answer to the logs question on its support center. Although the program was previously found to have installed a root certificate (making it a potential vector for a man in the middle (MitM) attack, CyberGhost 6 has retired this practice. Finally, its adoption of the SHA256 authentication algorithm along with its strong encryption up its trustability for those doing their due diligence. 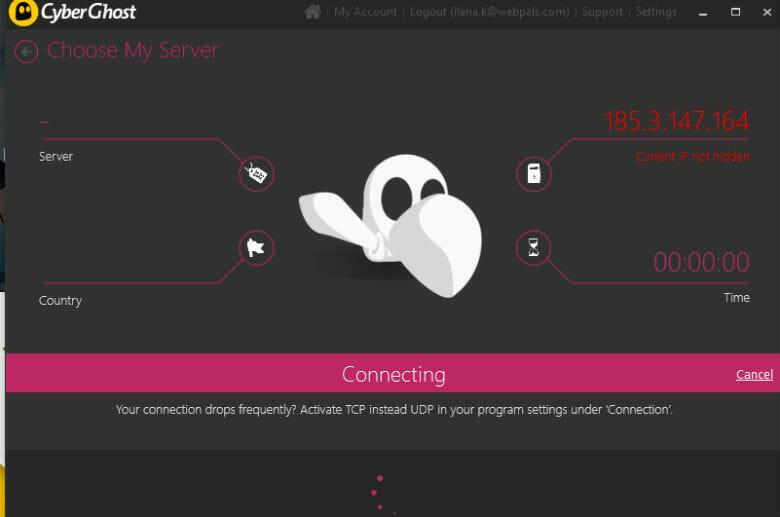 Setting up CyberGhost VPN is a quick and uncomplicated process. Unlike many of its competitors, because CyberGhost also offers a free service, it does not force its users to even create an account to get up and running. To get started using the software, users must simply navigate to the download page, chose their platform, and the CyberGhost download immediately initiates. It really doesn’t get much simpler than that. How does the platform rank in terms of its user-friendliness? The user experience is reasonably straightforward – without being fantastically impressive on many fronts. Unlike CyberGhost 5, the current version, CyberGhost 6, features a tidy icon-based homepage which makes accessing the main parts of the app straightforward. CyberGhost Crack also places links to support and settings in a convenient location towards the top of the dialog box. This means that users can open a ticket directly from within the app – a nice convenience. Whether they want to access CyberGhost Mac, CyberGhost Android, CyberGhost Chrome, or CyberGhost Linux or even install the program directly onto a home router, users are literally spoiled for choice with well-designed applications that make using the service quick and straightforward. Users that want to have the VPN run exactly as they decree will be pleased with the strong selection of options included with the package. These include a virtual network card repair tool to make sure that there are no software issues with the outbound VPN connections; the ability to force connections to travel via TCP instead of UDP, and a well-featured proxy selection area where users can specify exactly how they want the VPN to connect through an intermediary server. If you want to take advantage of CyberGhost’s multi-platform app support and can envision yourself wanting to use the VPN on your multimedia center while you simultaneously CyberGhost torrent, the company’s support for up to five simultaneous connections will be a feature you’ll certainly be excited to take advantage of. CyberGhost didn’t skimp when it came to laying on the security features. All connections are encrypted using military-strength AES 256-BIT encryption using a 2048-BIT RSA Key. And as of this month, the company is using the SHA256 authentication algorithm. For those that want to know that their VPN is doing all in its power to stop their traffic falling into the wrong hands, CyberGhost is a good option. Every VPN has a feature or two that is either unique to it or hard to find elsewhere. CyberGhost’s is data compression. 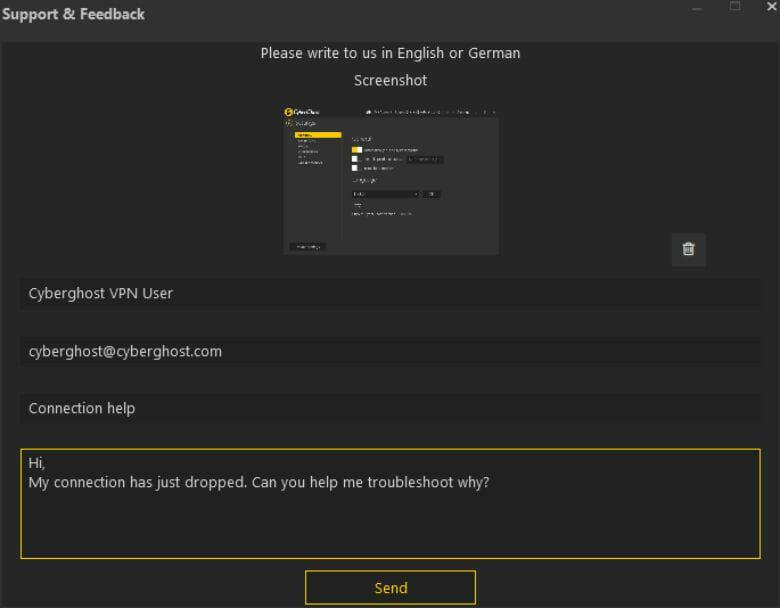 CyberGhost’s data compression feature, which can be turned on before connecting to a VPN server, reduces the impact that images and text have on bandwidth consumption. The company has stated that users can realize up to five-fold reductions on their data usage through the feature. Although many now enjoy generous data limits from their Internet Service Providers (ISPs) for those that are not so fortunate, this will be an appreciated addition. What good is all that music and video streaming if CyberGhost will cost more than the subscriptions to these services combined? Fortunately, we’re here to tell you that that’s not the case. The service is currently available at a smashing 18 month subscription rate of just $2.75/month (among the lowest we’ve seen). The one month plan is $10.99/month; it’s $7.99/month for six-month subscribers; and $4.99/month for those joining for a year. All plans come with a 60-day money back guarantee. Bitcoin enthusiasts are out of luck, however. Unlike some alternatives, CyberGhost doesn’t currently appear to support payment in cryptocurrencies (although it has done so in the past). There isn’t much wrong with CyberGhost. I’ve been able to use Netflix with no problems and there are hundreds of servers out there. I’ve used both the free and premium versions of this service. If you’re a light user, then free service may be sufficient. However, I recommend you get the premium service if you are a heavy user or do a lot of traveling. This has been a lifesaver while traveling for business, not just for getting around blocks for sites like Netflix but also for connecting back to my office’s home network. eh…i used CyberGhost and it was free. It was awful, you had to wait everytime and it hardly did any of the things you’re talking about here. I don’t understand? Thanks for commenting! 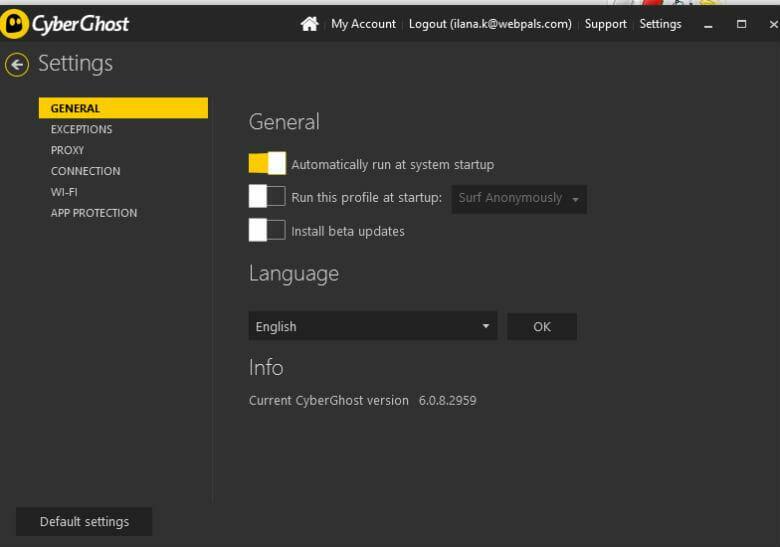 CyberGhost does offer a free version of their VPN alongside a paid version. The major difference is that the free version does without many of the features you saw mentioned in our review, and it also tends to be less effective than a paid subscription. The company’s subscription service offers a full feature set, as well as better browsing speeds and a larger variety of servers and locations to choose from. We encourage you to give the paid version a try, as it may surprise you, and give you more robust protection than their free alternative. Let us know if you elected to subscribe, and how it works for you! It’s good to see the smaller VPN companies growing in functionality. I’ve never seen anything like a file compression feature on a VPN before. Really impressed with Cyberghost. The fact that they are based out of the Isle of Man is not a problem if you aren’t selling drugs or something like that. I traveled around Europe for a few months and with the unlimited bandwidth was always able to connect to Netflix without any problem even through public wifi. Highly recommended for anyone who wants a secure, no fuss no muss VPN while traveling. CyberGhost has an impressive 830 VPN servers across 27 countries. I was happy to see some rare locations like Hong Kong, Singapore, and Israel available. There are also a whopping 136 servers in the US, making CyberGhost a great option if you are looking to unblock US streaming services. Also, I’m pleased to note that CyberGhost uses perfect forward secrecy to further increase security. A random secret key is generated for each session, making it much harder to compromise a VPN connection. Cyberghost VPN has a free service, and as a student, that settles it all. I like the anonymity of it and since I’m not based in the UK, it isn’t a problem to me. It’s also affordable, fast and secure. Cyberghost rocks when it comes to getting around blocked sites. When in the US, I can get around international blocks such as those for BBC iPlayer. When I travel to Sweden, I can still watch Netflix from home without any issues. Their support is solid and great for when I travel but their hours aren’t ideal for US customers. Besides that, you can’t go wrong with this one. Cyberghost is good vpn it provides service for most of the networks but it is slightly expensive then other available vpn in the market. Not sure what kind of internet you have in the review but I’ve been connecting through the VPN from various European connections for Netflix while traveling abroad without a problem. I know Netflix is being difficult for some users these days but thankfully this one seems to be one step ahead without sacrificing quality. Hopefully stays that way. It doesn’t connect properly and it doesn’t even change location. I get the message connecting in location and IP tab. I tried using it in Fire stick, Computer, Mobile and all have the same result. Highly Not recommended in India. I have been using CyberGhost VPN for last few years and it works pretty fine. Thanks to the development team because now I can work without fear of getting caught by my ISPs. Thank again! Cyberghost offers great protection! I can use up to 3 of my devices at the same time. It has a very simple and effective interface and works with many countries. I’m not great with technical stuff – and I can still use Cyberghost! It’s not tricky at all and it doesn’t slow down my computer either. I also didn’t need to put in my email, which I liked. It looks nice too, and I can also watch US TV shows and Netflix. CyberGhost VPN runs fast, lets me stream content from everywhere worldwide and is really secure too. I watch Hulu, BBC iPlayer and now Netflix. I tried to get in touch with their live chat customer service, but apparently they’re only at work during Eastern Europe time – but that’s not too bad, I rarely have contacted them and I like the VPN. Yes, it might be a bit pricier than other VPNs on the market, but you really get what you pay for. It’s honest and open, with 256-AES bit tech, so they’re very secure. Did I mention the unlimited bandwidth?